Model stitched on 18ct. Natural linen Aida using Crescent Colours: Ginger Snap, Purple Aster and St. Bernard. Design size: 29 wide x 29 tall. Uses 2 Small Butter Star buttons #3462.S by Just Another Button Company. 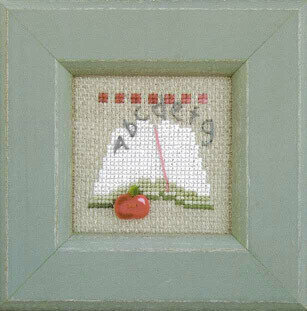 Model stitched on 18 count Natural Linen Aida with Classic Colorworks floss (or DMC 523, 3687, 3865, 930, 935) and shown with buttons from Just Another Button Company. The stitch count is 30W x 27H. Sand Pail! 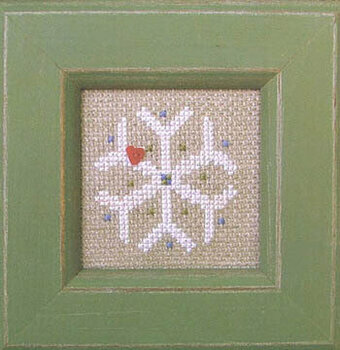 stitched on 18 count linen Aida using Crescent Colours floss. DMC alternates listed as ecru 931 3722 676. Stitch count: 28x28. Sand Dollar button from Just Another Button Company 4514S. 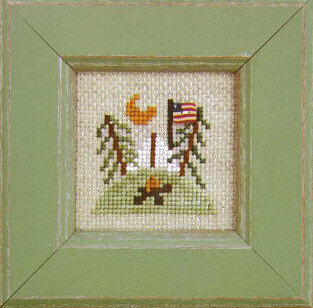 Model stitched on 18 Ct. Natural Linen Aida with Classic Colorworks floss (or DMC 938, 3363, 976, 935, 3866). Stitch Count: 30W x 29H. Shown with buttons from Just Another button Company. Model stitched over 2 threads on 20 ct Aztec Red linen by Weeks Dye Works with one strand of Caron Collection Watercolours. (DMC substitutes are 3346 3347 930 931 791 793 3866 972 3045 3854) Stitch Count: 102W x 141H. Buttons from Just Another Button Company sold separately. "This Winter of love." Includes buttons. Model stitched on 30 Ct. Parchment using Weeks Dye Works floss. (DMC alternates are 3766 320 470 611 3790 3819 3354 3688 866 989 b5200 white) Stitch count 99x58.